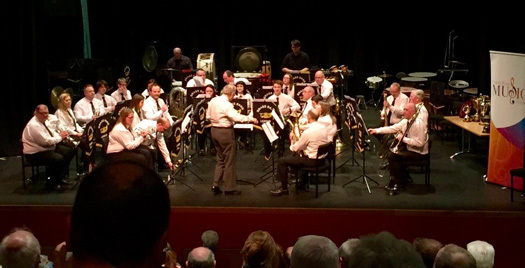 The 2016 annual BBL Spring Festival in association with The North West Musical Festival was held for the eighth time on Saturday 16th April 2016 in the Alley Theatre in Strabane. This was the first Spring Festival for the band competing in the Championship Section after moving up during 2015 after an impressive run of 4 consecutive wins at this contest (matching the 4 in a row achieved by the band at the annual entertainment contest in Fivemiletown) in the second section. Today the band achieved a 5th place performing Gilbert Vinter's "Variations on a Ninth." The section's soloist prize was also awarded to our principal cornet player - Claire Hueston. It was further announced that the band had been awarded the title of "Band of The Year" in the second section for achievements during 2015. The adjudicator for the contest was Mr Nigel Boddice M.B.E., Hon. A.R.A.M. This also was a particularly poignant day for the band as our esteemed Conductor and mentor Des Graham presided over his last contest as he has decided to retire after 30 years of unfaltering leadership, teaching and dedication to the Third Carrickfergus Band. Our gratitude for his work and devotion over this time is sincere and he will be sorely missed by us all. We would like to wish him well in his retirement and will celebrate his time and achievements in the forthcoming weeks. The band would also like to thank all the members for the effort and teamwork as we continue our quest to improve and be the best we can with particular mentions to our soloists today, Peter Graham, Ryan McFaul, Amber MacLennan, Peter Arthurs and our Best Soloist prize winning Principal Cornet, Claire Hueston.